The Importance Of Sunlight For Health And How You Can Practice Safe Sun! In this modern age we are told rather brainwashed about how the sun is harmful for our skin and our body, with the ads and the boat loads of beauty products launching everyday telling us, men and women around the world how the Sun harms us when we are exposed to it. The researcher suggests that the Ozone layer in our atmosphere prevents and protects us from the harmful rays of the sun, known as the Ultra Violet rays (UV) to penetrate into our skin. Because of the profuse amount pollution in the Earth’s atmosphere, there are large holes on the Ozone that now it provides little or no protection from the UV rays of the Sun. Nonetheless the Sun is indefinitely the power system of our planet, and it still provide us source of energy and Vitamin D into our body. Why do we need Vitamin D from sunlight? Vitamin D is an essential nutrient that helps built our bones and helps give energy into the human body. The Sun also provides an abundant amount that penetrate into our skin and helps the human body to fight diseases such as; Alzheimer’s disease, Autism, Depression, Gum disease, Heart disease, High blood pressure, Multiple sclerosis, Obesity, Parkinson’s disease, Certain cancers, Rheumatoid arthritis, so on and so forth. Firstly, the sun helps improve our immune system in ways more than one: it helps produce MSH which is an important hormone that helps weight loss and provides us energy to function daily. The sun rays are a valuable source of Vitamin D. We must use some basic sun protection in order to protect us from the harmful rays. But a little exposure of the sun helps us rejuvenate the lost Vitamin D which we derive from the Sun. Secondly, doctors recommend 20 to 25 minutes in the Sun is enough to draw in vitamin D from the sun. It provides prevention of heart diseases and other diseases as mentioned above. Thirdly, the sun helps to synthesise Vitamin D with the help of dermal synthesis. But the human body is unable to synthesise the same biologically as it is biologically inactive. In order to activate the same the conversion of enzymes is required to be activated known as hydroxylation in our kidney and liver. However, it is difficult to achieve the optimal level of vitamin D synthesis, within our body. After an intense research by the institute of Medicine United States (US), it have been discovered that such form of synthesis of vitamin D from sun exposure is harmful to the human body and exposes us to the risk of cancer. The feedback from the Institute of Medicine regarding vitamin D from sunlight is negative. Therefore, dietary intake of Vitamin D is highly recommended so as to fulfil the gaps. Fourthly, sunlight provides us ample energy. We have our very own solar power source which provides us a substitution of power and energy. The huge solar panel that conserves energy throughout the day has proven to be a natural resource as petroleum and other natural gases perishable and limited. Sunlight is also used by plants for photosynthesis. 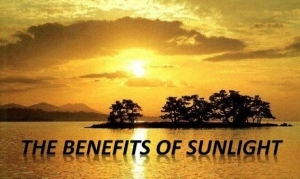 However, keeping aside the unprotected from the sun’s harmful rays it actually offers us countless benefits. It alone helps plants synthesise fresh oxygen for us to breath. It not only helps us to breathe and live, but also to live healthy by destroying most of the disease causing germs that dwell in our own homes in dark and damp places. Places, where sunlight cannot penetrate, is considered to be unhealthy and harmful for our wellbeing. Lack of exposure from sunlight can cause bone brittleness which means deficit of vitamin D.
The deficit of Vitamin D can cause diseases like Rickets, Osteomalacia etc. Doctors recommend patients with the deficit of vitamin D to walk under the sunlight often to help with the formulation of vitamin D.
Fifthly, as it is known worldwide too much exposure of sunlight can cause a lot of harm and damage to the skin and other organs. The harmful radiation from the sun, especially the UV rays can cause skin cancer. 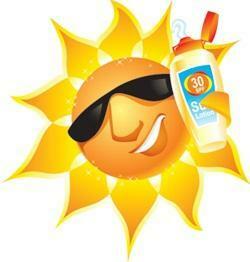 Apply sun protective in decent amount! Therefore, it is recommended to use a minimal amount of sun protection and not to have too much direct exposure of sunlight. Various brands of cosmetics and medicated cream provide an immense amount of protection. But the fail to give 100% protection, as it is impossible to do so. The only protection from the ultra violet rays our planet has was from the ozone layer. Now that have almost disappeared due to the uncouth pollution and exploitation of natural resources, we have come up with various chemical formulas to protect us temporarily from the sunlight. Doctors, under every circumstance, recommend us to take sun protection either medicated or there are millions of brands that provide the same. The summers cause a booming sale in the sun block creams with SPF 30 or SPF 50 that provides us temporary protection from the sun. It cannot protect us entirely, but try our level best to protect ourselves from the harm caused by the harmful rays.Sun protection is essential in these days and as the days go by it shall become more and more essential for our protection. In conclusion, as the days go by our technology will modify and develop to such a level that humans will find ground-breaking methods to protect ourselves from the harmful rays of the sun and also find groundbreaking techniques to reserve our energy and also provide alternative energy. However, the harm it can cause a human being one must not for that innumerable ways the sun helps us in our health and in every way of human life form. Why without the sun shining out planet would be dead. Nothing would have grown or lived. Sunlight is very important for our overall health and for our livelihood but protection from the same is also required, as we all are aware of the incredible damage it can cause us if not supervised and protected from it. This entry was posted in Health, Skin and tagged benefits of sunlight. Why Supplements Are A Necessity?